Bill Pooley reports on the Kaweah River Page that the first descent of the EF Kaweah is thought to have been done in 1997 by a group of Team Perception paddlers. It has only become popular in the last 4 or 5 years as word of mouth has finally got out. Despite its apparent short length, a descent of the EF Kaweah below Oak Grove Bridge presents a formidable physical challenge to potential descenders. The difficulty is sustained, the objective hazards very real, and the gorge is, for the most part, inescapable with river level scouting and portaging often impossible. Small groups of star paddlers with the lines well worked out can make the run in 5 hours, larger groups of first timers are likely to be closer to 10 hours before catching the welcome sight of the MF Kaweah confluence. Numerous mandatory short portages around sieves are required and the 3 largest rapids, whilst they have all been paddled with mixed success, are commonly portaged via slow and grueling terrain. Given all this one might wonder why anyone would bother to paddle this stretch at all, and the answer is simple with 1250 feet of descent over 4.3 miles nearly all via clean but serious granite bedrock rapids. The traditional putin is at the Oak Grove bridge, however, as of Winter 2006/2007 a large piece of a mid stream boulder that had previously formed a large runable or easily portagable drop ("The cave drop") broke away, falling into the water downstream and forming a river wide sieve that is extremely difficult and dangerous (impossible at higher flows) to portage. As of spring 2007 parties have taken to parking at the bridge but then walking downstream along the road for a 1/4 mile until a shabby looking trailer is encountered ("The crack shack"). No one has yet to be encountered in residence at the trailer, and a retasked swimming pool ladder marks the start of a quick and easy trail down to the river, bypassing the new portage. This trail is undoubtedly private land and keeping a low profile hence advised. Another trail that leaves from the old helipad some distance downstream near the Skyhook Ranch has been used by some parties to do a shorter run that eliminates the Skyhook portage, however this trail is brutal and could take an hour to negotiate itself, as well as requiring a rope to be left to complete the final part of the descent. Once on the river blind and steep drops will be frequently encountered and if there is any uncertainty about what the drop entails then a scout is indicated given the very real chance of dropping into a fatal sieve. Nevertheless teams will need to be efficient and expeditious in maintaining a good pace or else they will finish paddling in the dark. When a large deck can be spied overlooking the river high on the left and the river is about to enter a smooth walled bedrock gorge then Skyhook has been reached. This rapid starts with several very doable drops but eventually a much larger drop leads into the final drop where most of the current smashes into a pocket on the left wall whilst falling over a tall drop. Likely failure to execute a line to the hard right here could result in very serious injury and this whole sequence is very commonly portaged on the left. The portage is physically demanding running across slick bedrock ledges and through as fine an example of California poison oak jungle as you will ever see. It is only the dedicated gardening instincts of those who pioneered much of current popularity of this run that save you from a certain case of the rash from hell. Beware, once the first drops of this rapid are run, you are committed, the smooth walls offer no purchase for those with a change of heart. Immediately after Skyhook, across a rare large and still pool another short portage is immediately encountered on the left. This portage ends with an intimidating 8 foot seal launch straight into the whitewater of the portage drop and another 10 foot drop to be immediately run 50 feet downstream. This blind drop should be boofed right with some right boat angle. After passing through a more open wooded area for some time the river makes a sharp left turn and immediately a large horizon line is presented with a gorge beyond. This is the the 3rd and final large portage which can either be done less dramatically by climbing a tree filled gully on the right of the pool and then following a well defined trail up to the historic wagon road for a portage of the whole gorge or lower by running the initial 10 foot drop and immediately eddying right in moving water at the lip of the mega drop then seal launching back into the heart of the gorge. 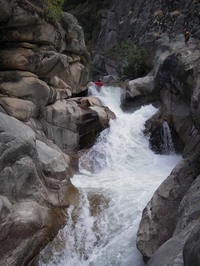 The final gorge is long and on a grander scale than previous gorges, however the nature of the rapids changes and large slides with moderate consequence are found back to back. In this gorge a 30 foot waterfall, Driftwood, is encountered which may be portaged left via delicate seal launch or throw and go. The waterfall itself is rather perplexing requiring paddlers to slide down a barely wet slab into a mass of whitewater confined between narrow walls from where upon its a complete whiteout. Some manky rapids and the occasional consequential larger drop are encountered after this gorge opens out but the MF Kaweah is soon reached. 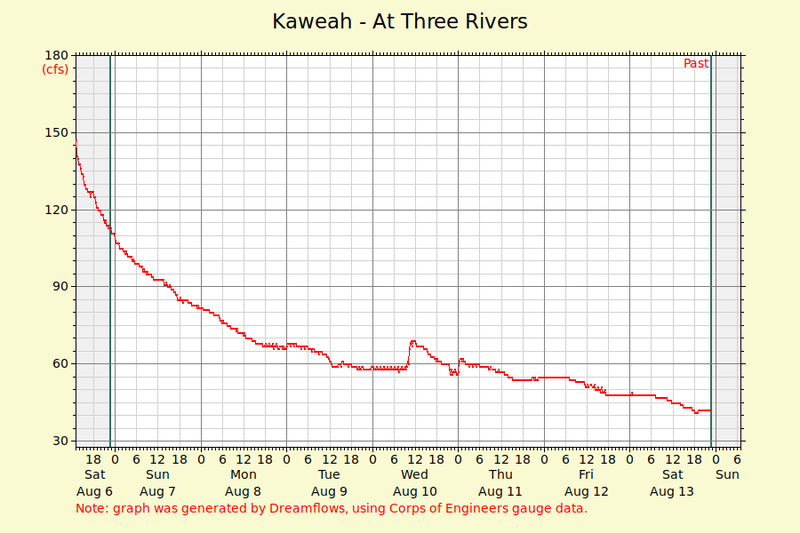 Dreamflows' gauge for the Kaweah River at Three Rivers, CA. which is below the confluence of the EF Kaweah and MF Kaweah. Common wisdom is that flows of 400-700 at Three Rivers produce boatable flows in the East Fork in the late spring, where as in the winter flows should be 900-1100. In channel flows should be 100-300cfs for this to be a safe and enjoyable run, 230-250 is perhaps optimal. Visually a good flow will look barely boatable at the gateway bridge. There are no wide spread markers in the channel used to directly gauge flows. An SCE/USGS gauge showed flows at the putin until recently, but appears discontinued for reasons unknown. It would be interesting to investigate if there is an easily accessible stick gauge at this site which is just upstream of the putin.